Scuba Diving in Fernando de Noronha. Noronha is world famous among divers. Get to know more about Scuba Diving in Fernando de Noronha. Pedras Secas (17m - 56 ft), regarded as one of the top 10 dive sites in the world has an impressive rocky formation of tunnels, caverns and canyons, covered with corals and sponges. Squirrelfish, black margates, grunts, sea turtles and sand sharks frequent this spot. Buraco das Cabras (16 m - 52 ft) is one of the most vibrant diving areas, with a plethora of colors emerging from the rock formations, and huge variety of marine and plant life seen here such as manta rays, barracuda, turtles, angelfish, octopi, hammerhead sharks, lobsters, blackjacks, corals and sponges. Morro de Fora (15 m - 49 ft) is a nursery site with several infant species, including flounders and queen angel fish. This and Cagarras Rasas (16 m - 52 ft) where fire coral and a huge number of beautiful ornamental fish can be viewed, such as surgeons and damselfish, are good spots for beginner divers. Laje dos dos Irmaos (24m - 79 ft) is the largest coral covered dive site of the island and attracts reef sharks and of schools of chromis, hawksbill turtles, horse-eye jacks and fine bearded sharks. At Iuias (24m - 79 ft) rock formations, covered with coral and sponges, have created narrow passages and fissures, where schools of fish take shelter. Sightings of big fish like jewfish and black grouper are often made as well as nurse sharks and eagle rays. Carragas Fundas (30m - 98 ft) is a wall dive with great flora and fauna biodiversity and rare reef fish such as gray angelfish and rock beauty can be spotted here. Cabeco Submarino (20 m - 66 ft) is probably the best dive area for turtle lovers. Cabeco da Sapata (43 m - 141 ft), an excellent multi level dive site, only suitable for advanced divers, due to the depth and strong currents, is a small submarine mountain that rises nearly above the water level. Here triggerfish, grunts, chromis and horse-eyed jacks can be found. Pontal do Norte (45m - 148 ft) is a huge submerged rock where large sharks, black groupers, snappers, rock hinds and hawksbill turtles are often sighted. Corveta V 17 (63m - 207 ft), with the well preserved remains of a sunken naval ship, is considered one of the best wreck dives in the world. Marine life frequenting this site includes mahi mahi, tunny fish, manta rays, mackerel, eagle rays and sometimes even a whale shark. 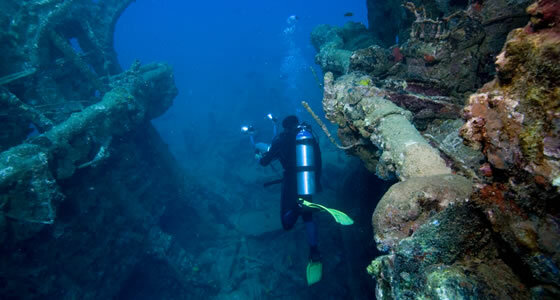 Advanced divers can explore the interior of the vessel.